No Good Things Happening in Iraq? Critics of the Iraq war are disinterested in such inconvenient things as truth and facts that contradict their perspective, but while so many of the good things that have happened there are kept off newscasts and newspapers in favor of the bad things, only a fool would pretend that no good results have been produced. The birth of democracy, like human birth, is never without pain, and difficult births are more painful yet. Where on Earth could circumstances exist that are more difficult for democracy to blossom than in Iraq, with its centuries-old culture of antithetical dictatorial repression? Yet, in three separate elections millions of Iraqis made a clear statement that they wanted to try democracy on for size, risking their safety and their lives to cast their vote. That alone ought to be monumental news, but in the United States, such mundane items do not rate as high as Iraqis killing their fellow Iraqi citizens, or thoughtful essays on the value of a democratic Iraq and the uphill path to get there. The fledgling government put deposed president/dictator Saddam Hussein on trial for a few of the myriad crimes against humanity he was accused of, convicted him in proceedings televised to the world, sentenced him to death in the fashion approved of by the Iraqi constitution, and shortly after the appeal process ran its course executed him. 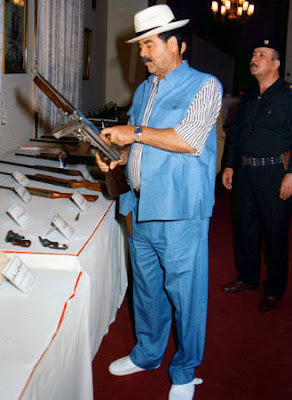 Saddam Hussein was not killed by another despot in a bloody coup, he was not assassinated while in office, he was not shot in the head upon capture, any of which are the more likely end of people like him in places like Iraq. No, he experienced the justice he denied rumored hundreds of thousands of people, and that he denied to those 184 people of al-Dujail he was convicted of killing. If it is not good news and a sure sign of progress that a nation that just three short years ago was under the brutal rule of a murderous dictator has replaced that regime with a budding democratic government with a system of justice that fairly tried, convicted and executed that dictator, then I don’t know what is.